김경철, 양인환, 조창빈,(2016).강섬유 보강 초고성능 콘크리트의 재료특성 및 휨 거동 역학적 특성.콘크리트학회 논문집,28(2),177-185. 이 논문에서는 강섬유 보강 초고성능 콘크리트(UHPC)의 부재의 휨거동을 특성을 파악하고자 하였다. 하이브리드 강섬유보강 초고성능 콘크리트의 압축강도는 150 MPa이다. 부피비 1.5%의 하이브리드 강섬유 보강 초고성능 콘크리트의 휨거동 특성 실험을 수행하였다. 강섬유보강 콘크리트의 압축 및 인장거동 재료 특성은 구조거동 예측을 위해 매우 중요하다. 강섬유 보강 초고성능 콘크리트의 하중-균열개구변위 측정결과를 이용하여 인장거동 특성을 파악하였다. 실험결과는 하이브리드 강섬유 보강 UHPC는 균열제어에 유리한 것을 나타낸다. 또한, 강섬유 보강 UHPC 보의 연성지수는 1.6~3.0을 나타내어 연성거동에 효과적임을 나타낸다. 모멘트-곡률 관계 측정결과와 해석결과를 비교하였다. 휨철근을 배근하지 않은 UHPC 보에 대한 휨강도 예측결과는 측정 휨강도를 다소 과다평가하고 있다. 전반적으로 본 연구에서 제시한 강섬유 보강 초고성능 콘크리트 재료 및 휨 거동 모델링 제안기법에 의해 압축강도 150 MPa 급의 강섬유 보강 콘크리트 보의 합리적인 휨성능 예측이 가능하다. This paper concerns the flexural behavior of steel fiber-reinforced ultra-high-performance concrete (UHPC) beams with compressive strength of 150 MPa. It presents experimental research results of hybrid steel fiber-reinforced UHPC beams with steel fiber content of 1.5% by volume and steel reinforcement ratio of less than 0.02. This study aims at investigating of compressive and tensile behavior of UHPC to perform a reasonable prediction for flexural capacity of UHPC beams. Tensile behavior modeling was performed using load-crack mouth opening displacement relationship obtained from bending test. The experimental results show that steel fiber-reinforced UHPC is in favor of cracking resistance and ductility of beams. The ductility indices range from 1.6 to 3.0, which means high ductility of hybrid steel fiber-reinforced UHPC. Test results and numerical analysis results for the moment-curvature relationship are compared. 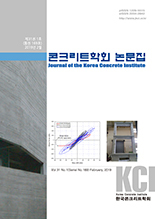 Though the numerical analysis results for the bending capacity of the UHPC beam without rebar is larger than test result, the overall comparative results show that the bending capacity of steel fiber-reinforced UHPC beams with compressive strength of 150 MPa can be predicted by using the established method in this paper. Alsayed, S. H., “Flexural Deflection of Reinforced Fibrous Concrete Beams”, ACI Structural Journal, Vol.90, No.1, 1993, pp.72-76. American Concrete Institute, “Design Considerations for Steel Fiber Reinforced Concrete”, ACI 544.4R-88,ACI Manual of Concrete Practice, Detroit, 1988. Ashour, S. A., and Waff, F. F. “Flexural Behavior of Highstrength Fiber Reinforced Concrete Beams”, ACI Structural Journal, Vol.90, No.3, 1993, pp.279-287. Association Française du Génil Civil (AFGC) Bétons fibrés à ultra-hautes performances. Association Française du Génil Civil, 2013, France. Chunxiang, Q., and Patnaikuni, I., “Properties of High-Strength Steel Fiber-Reinforced Concrete Beams in Bending”, Cement & Concrete Composites, Vol.21, 1999, pp.73-81.